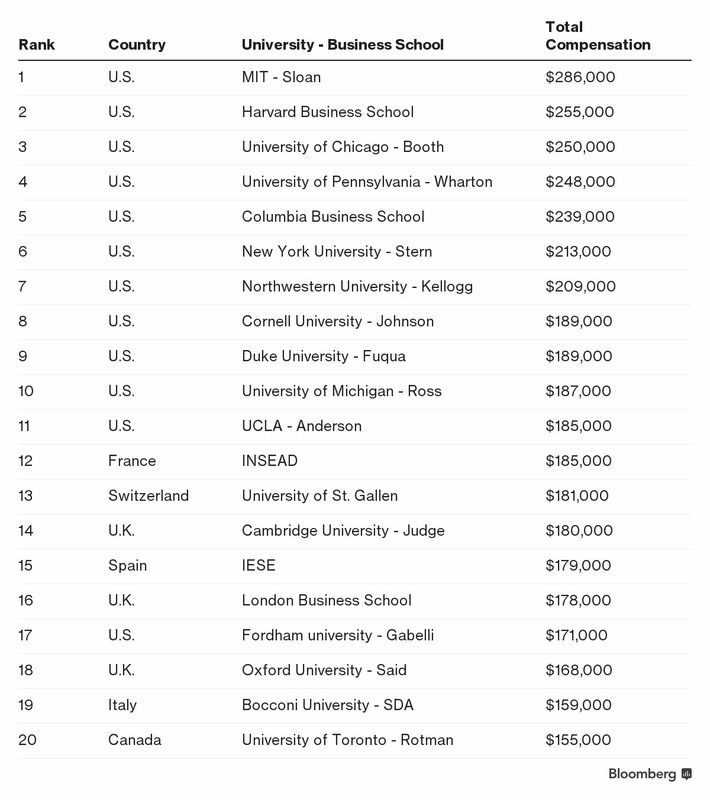 (Bloomberg) — It’s little surprise that the best-paid MBA graduates are from American universities. What is unexpected is just how much U.S. schools dominate the rankings. A new survey of the 20 best-paid graduate business schools found that the top 11 are all in the U.S. The Sloan School of Management at the Massachusetts Institute of Technology came out on top, with a median salary and bonus of $286,000, according to a survey from Emolument.com, a crowdsourced site for benchmarking salaries. Graduate programs at Harvard and the University of Chicago finished second and third. Europe’s highest-placed school, the INSEAD business school in Fontainebleau, France, came in 12th place overall. Its graduates earn a median pay and bonus of $185,000, the survey found. The University of St. Gallen in Switzerland ranked 13th, and the Judge school at Cambridge University was U.K.’s best performer, ranking 14th globally. None of the top 20 were in Asia. The findings are a boost for Sloan, which placed third on Bloomberg Businessweek’s 2017 ranking of U.S. business schools. Harvard topped that list for a third straight year. INSEAD was the highest-ranked international business school by Bloomberg.